any do car work on the side? audi master techs? i saw the gurus up top but wasnt sure if they do side jobs. 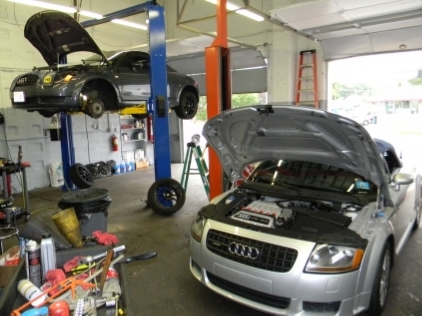 I started off with side work, but now offer a full service shop with an alternative to dealership pricing! Alex and Sergey do good work at reasonable prices. They are located on Newman Springs Road in Shrewsbury, past Brookdale Community College. I know this because I went to Brookdale back in '05 before I moved to the Easton, PA area. Thanks, I will have to check them out.If he has good prices they will do all my work.I hope they are still.in business. Quality, honesty, and vehicles with 4rings on them are just a couple of things that we specialize in. Last edited by 4ringking; 05-30-2013 at 11:14 PM. They gave me a FANTASTIC price to do my tc! Two weeks will be getting done.John is working on the cost for timing belt everything included water pump tensioners the complete job.I know it will be a GREAT PRICE! Im so glad to have found this website! He is even getting me a price for a rental car! They will be doing all my Audi work!!!!! Work has been done! John hooked me up! Car is AWESOME now! Always was but its alot better now! It has been a pleasure working with you! See you in a few weeks for the brakes!